Wood serves a range of purposes for hamsters, bedding and entertainment among them. Choose the right kind of wood for your hamster's needs, avoiding those that are bad for hamsters, to keep your pet healthy and happy. Wood works well as a nice chew toy for hamsters, offering both entertainment and a hard surface for grinding down their teeth. Look for hardwood that has not been treated with chemicals or painted. Wood from fruit trees also works. Pet stores sell specially marked wooden pet chews suitable for this purpose, convenient if only because you know they are suitable. As an alternative to wood blocks, the ASPCA suggests hard dog biscuits. You can find your own wood for your pet hamster, provided you are certain the wood has not been chemically treated. Choose twigs and branches from hard wood trees in your own yard, such as oak or maple. Avoid soft woods, such as pine and yew. These can splinter and scratch the inside of your hamster's mouth when chewed. Wood shavings make a nice, absorbent bedding for hamsters. The shavings are soft enough that you hamster can burrow into them for a snooze and absorbent enough to soak up urine. Choose aspen shavings for this purpose. Avoid cedar or pine shavings, which can make your hamster ill. Sawdust is likewise unsuitable here. Other good bedding materials suitable for hamsters include pellets, shredded newspapers and timothy hay. If your hamster chews on materials other than wood or cardboard in her habitat, such as wire cage bars or plastic tubes, she may be bored. Offer her a niece piece of wood to chew to provide stimulation, or switch out the toys in her habitat to alleviate boredom. 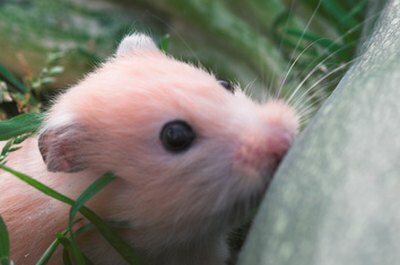 Since your hamster can and will chew through wood, avoid using wood as a hamster cage or cage lid. "Hamsters"; Louse A. Spilsbury et al.